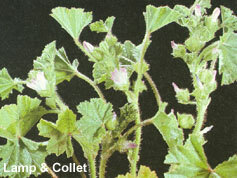 Growth Habit: Mallows are very competitive weeds that range from low growing ground covers to a small shrub. They have mid to light green leaves with dominant veins, are gently serrated at the edges and are pleated in appearance. Both species are widespread in Tasmania. Type of Plant: Perennial. M. parvifolia may grow to 500mm, whilst M. sylvestris may reach up to 1m. Flowers: Both species have small pink to mauve, 5-petalled flowers, which bloom in summer. Fruit/Seed: Several wedge-shaped seeds are produced per flower. Dispersal: Reproduces purely by seed. Distribution: Mallows can be found on cultivated land, vineyards and orchards, roadsides and gardens. Mallows may form very competitive infestations in perennial crops, such as vineyards and orchards. Once established, they can be very difficult to eradicate. Grubbing (all year). Remove entire plant by hand or garden implement. Herbicide (summer, spring and autumn). Herbicides registered in Tasmania include triclopyr, glyphosate and fluroxypyr.